and this one below. 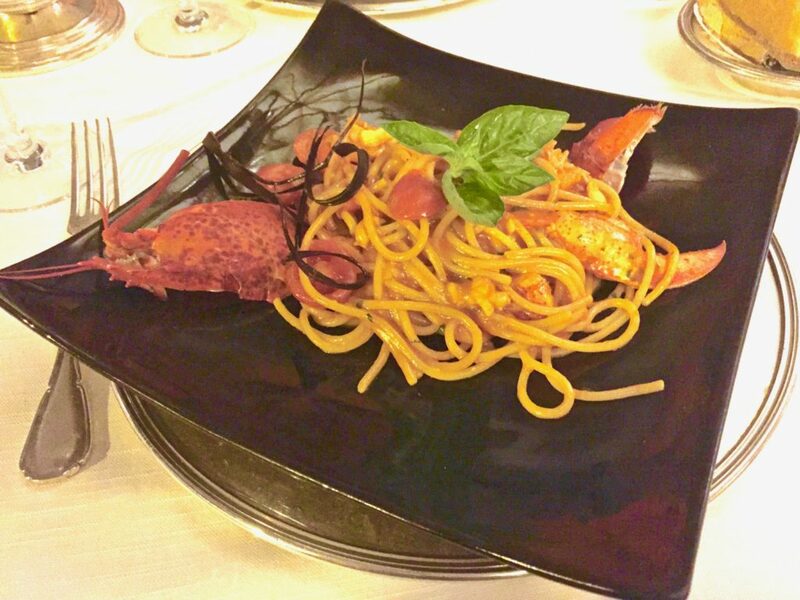 In Italy, they’re called astice, the Mediterranean version of North American lobsters. Italy also has aragosta, similar to North American lobsters, but without the large claws. When we returned back to the states, I was determined to make this dish at home. It’s not at all hard to make, but can be pricey depending on the size of the lobsters. But it’s a great meal for a special occasion and can be partly prepared ahead of time, making it easy for entertaining. 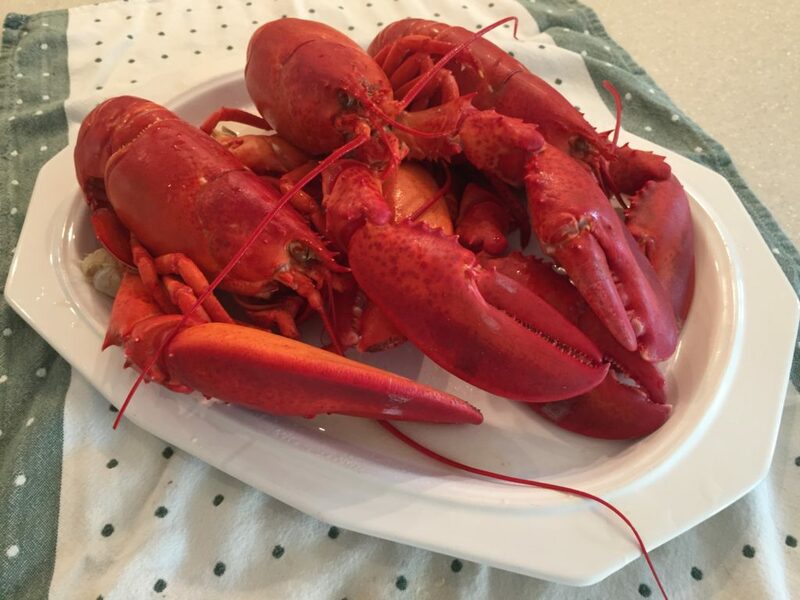 A few weeks before making the lobster fra diavolo, we enjoyed a Fourth of July steamed lobster feast with friends, from which I saved and froze some of the carcasses. The broth you can make from these adds a great depth of flavor to the lobster fra diavolo, but if you don’t want to fuss with it (or don’t have the lobster shells ahead of time), use bottled clam juice. I simmered this broth for a couple of hours before straining through cheesecloth. It made way more than I needed for this recipe, so I froze the rest, to be used for other recipes in the future, such as a lobster or shrimp bisque. 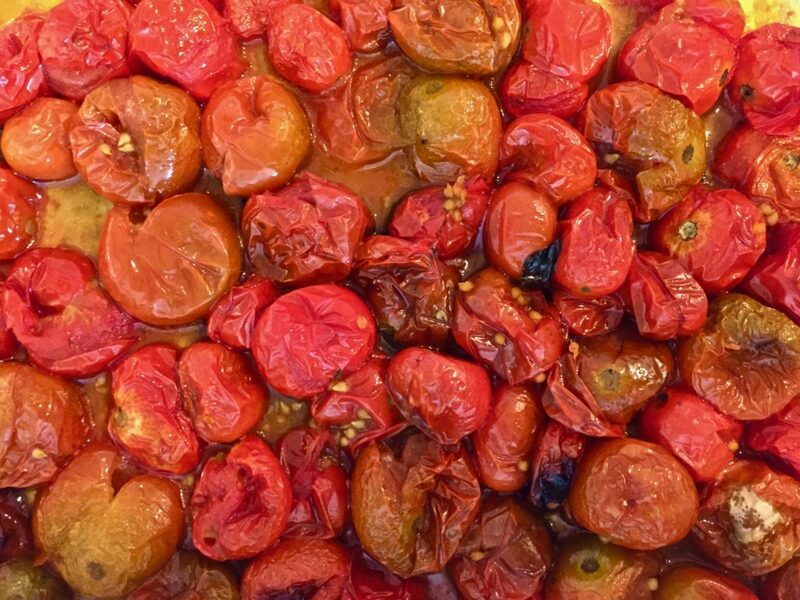 I love the sweetness of cherry tomatoes and there were an abundance of them in our garden, so for the sauce, I roasted a bunch with some olive oil at 425 degrees for about 20 minutes, until they split open. 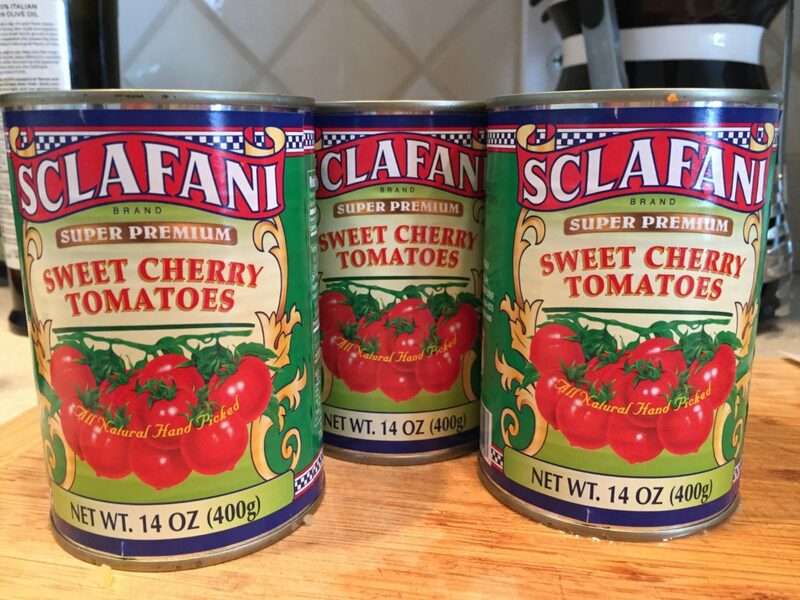 If you don’t want to use fresh cherry tomatoes, or don’t have any, use the canned. 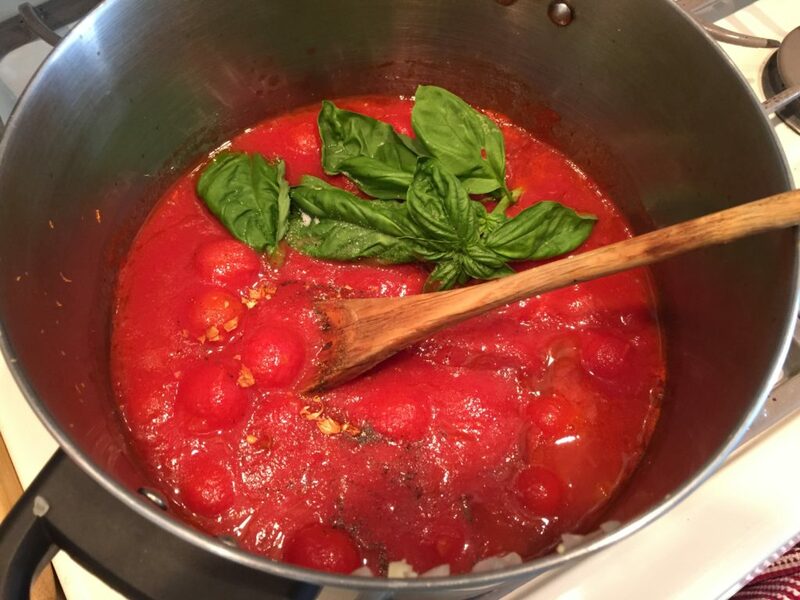 The ones packed in Italy are so deliciously sweet, I like to keep a few cans on hand for other recipes too, like my codfish and chickpeas in tomato sauce. Follow the instructions for the sauce in the recipe below, and simmer for about an hour. You can even do this the day before. The best way to make this dish is with fresh lobsters. If you don’t have fresh lobsters near where you live, then frozen lobster tails will make a nice substitute. 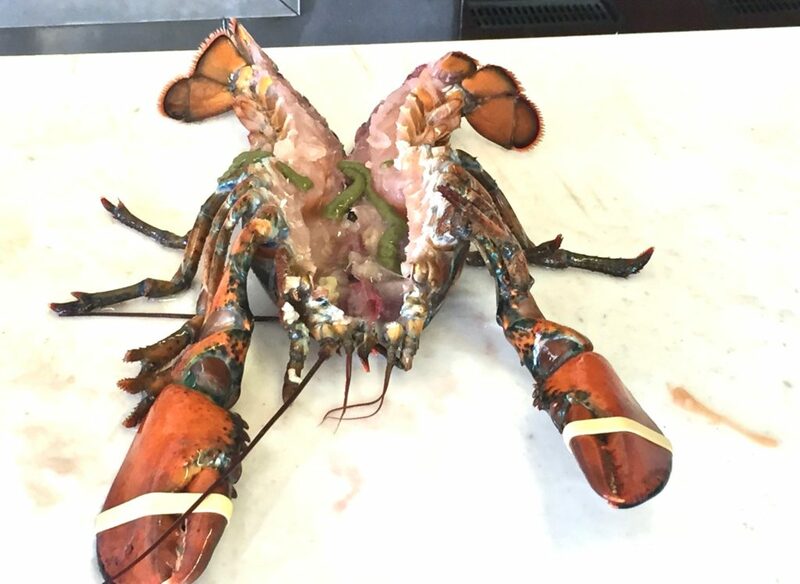 If you do live near a good fish store, your fishmonger can use a knife to quickly dispatch the live lobsters, then clean them and split the tails in two. I also asked him to break off the tails and claws from the main body, and crack the claws so it would be easier to remove the meat once the dish was served. He was more than happy to do it. When the sauce is cooked, add the lobster pieces. In the time it takes to boil the water for the pasta, the lobster pieces will be cooked. Remove the lobster pieces to a dish and keep covered to stay warm, then add the pasta to the sauce and mix. Place the pasta in a serving bowl and surround with the warm lobster pieces. Provide plenty of napkins and some way to crack the shells further, if they don’t open enough. Eating this dish was almost like being back in Italy (almost). And now for the blogiversary and giveaway. Hard to believe that ten years have gone by since I started this blog. I’ve taken a few breaks from blogging now and then when life has thrown me a curve ball, but even then, getting back to blogging has been a catharsis for me. I’ve met so many wonderful people in person because of Ciao Chow Linda, and it has given me a forum to showcase a few things I love doing – traveling, cooking, writing and taking photographs. In the beginning, my only readers were family, but through the years, so many of you have come aboard the Ciao Chow Linda train and left comments, or sent me emails and I am eternally grateful for your support. I read all of them and they really encourage me to keep doing what I love best. 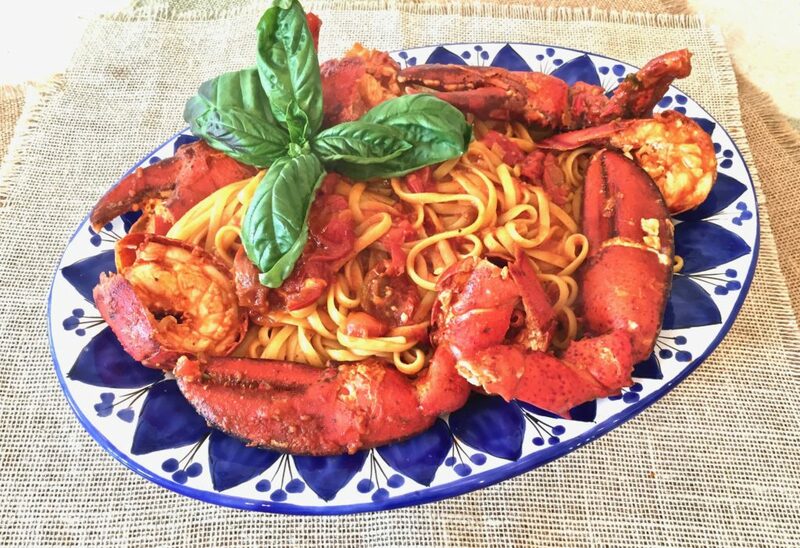 As a thank you to one of you (I wish I could do this for all of you), I’m offering a giveaway of a $100 gift card to LobsterGram, so you’ll be able to make this lobster fra diavolo or any other recipe you like, using fresh live lobsters sent directly from Maine. All you have to do is leave a comment on the blog telling me what recipe you’d like to see on Ciao Chow Linda (NOT by email), with a way to contact you if you’re chosen (by a computer generated random number). To increase your chances of winning, follow me on Facebook, Instagram, Twitter or Pinterest, and say so in the comments. Buy two fresh lobsters and ask your fish monger to kill them while they are still alive. If you don't have access to fresh lobster, you can always use frozen (and thawed) lobster tails, but fresh is always best. Have the fish monger remove and crack the claws, and break off the tail, then cut it in half lengthwise. You won't need the part with the lungs and there is so little meat in the legs (also impossible to extract), so don't bother with those. 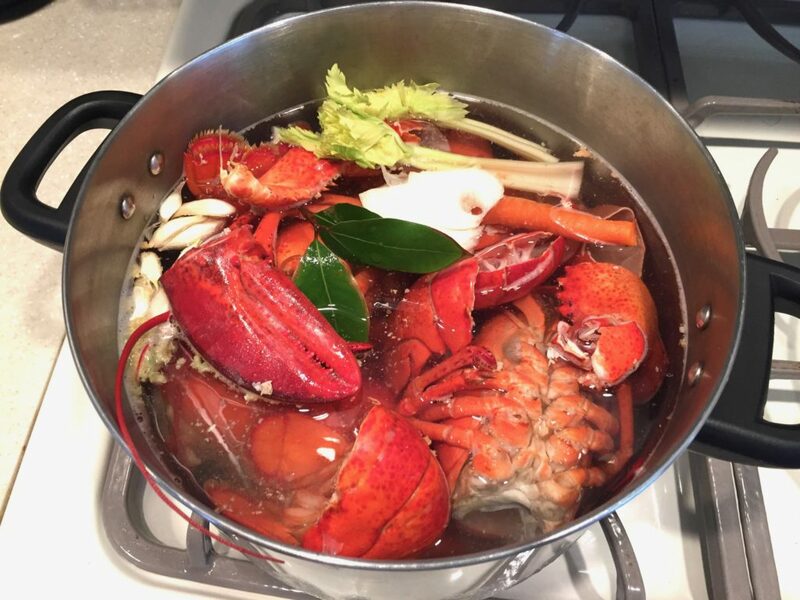 Make the lobster broth by placing the lobster shells, onion, carrot, celery, bay leaf, salt and pepper in a large pot, covering amply with water. Bring to a boil, then simmer for a couple of hours and reduce slightly to let the flavors intensify. Drain through a cheesecloth, discarding all but the broth. You will need only a small part of this broth. Save the rest to make other recipes, including lobster or shrimp bisque. Sauté the onion in the olive oil until soft. Add the garlic, celery and carrots and sauté over low heat until softened. Add the tomatoes, the puree, the wine and seasonings and let simmer for about an hour. Remove about 1½ cups - 2 cups of the sauce and set aside. You may want to add some back to the pot later when you add the pasta, but you should have enough to put some in the freezer later for another recipe. To the remainder of the sauce in the pan, add the lobster broth. Simmer for another 20 minutes. Add the lobster pieces to the sauce and cook with the sauce over low to medium heat, with the lid on. 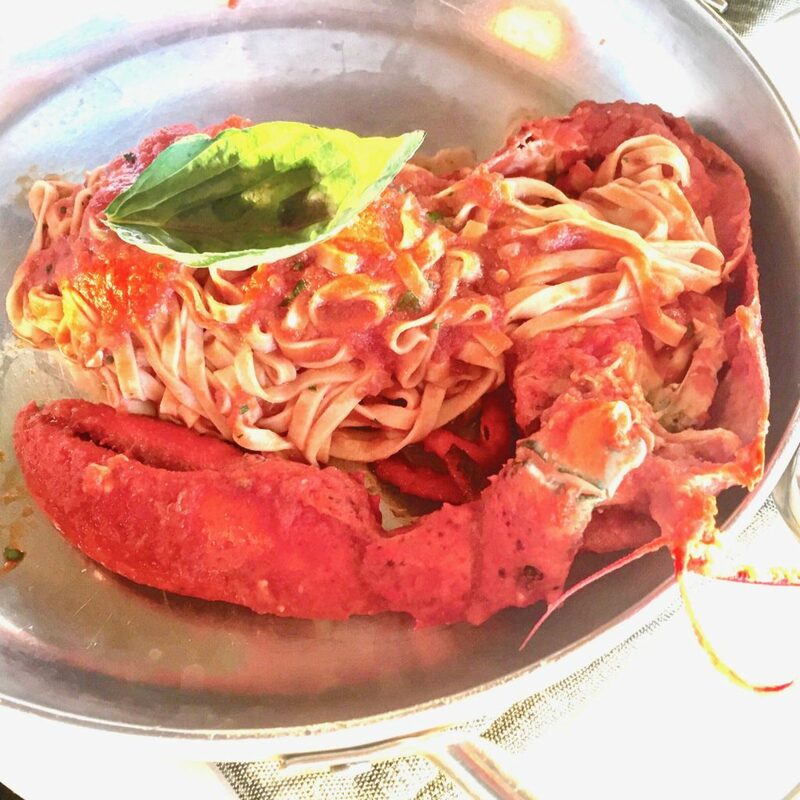 While the lobster is cooking, cook the pasta in boiling (salted) water until al dente. 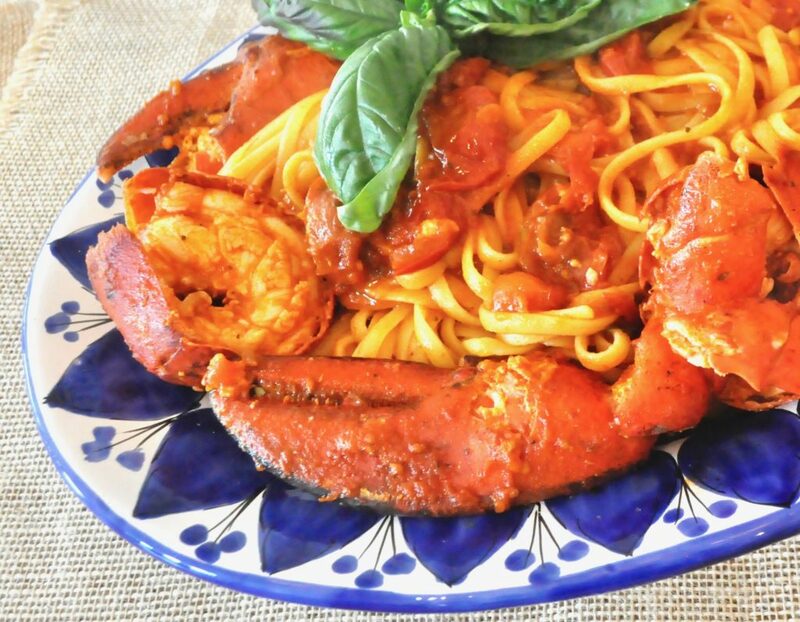 When the pasta is nearly cooked, remove the lobsters from the sauce and set aside on a covered dish. Drain the pasta, and add it to the pot with the sauce. Swirl the pasta in the sauce, allowing it to absorb all the flavors. The pasta should have enough sauce to cover, but not be swimming in sauce. If necessary, add some of the reserved sauce. 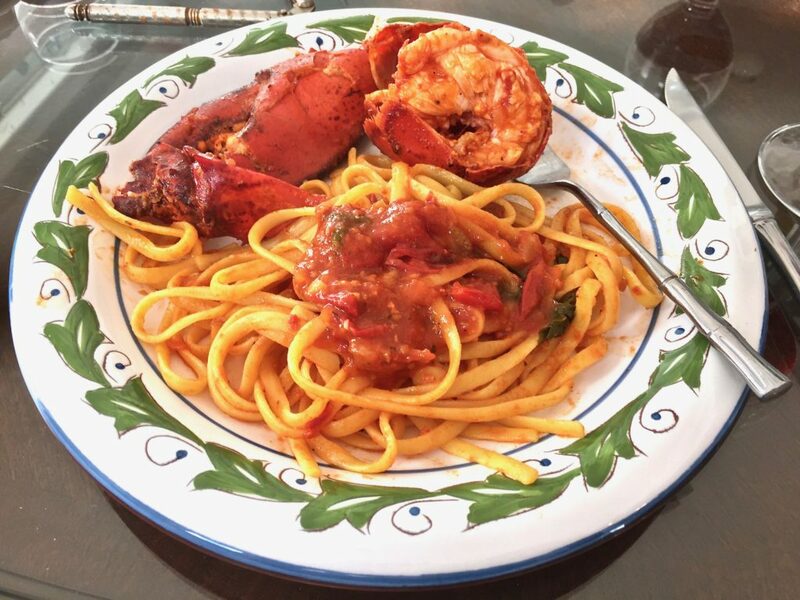 Place the pasta in a serving bowl or dish, and place the lobster pieces all around.